After a long period in which it was taboo, it has become fashionable once again to speak of spirituality in art. Very often, however, the term is misused. Only rarely does it truly apply, as in the case of María de Echevarría, whose exhibition "Toward Another Dimension" was seen recently in a solo exhibition at the Consulate General of Argentina, 12 West 56th Street. Working for most of the year in New York City and part of the time in another studio in New Mexico, de Echevarría produces paintings that convey a sense of the ethereal. In some paintings, beings of light are seen traversing a landscape that seems to transpose the climate and landscape of New Mexico onto an imaginary realm. In other oils on canvas, the landscape alone conveys a sense of the spirit world. One of the most striking works in de Echevarría's most recent and by far most impressive exhibition for its breadths and scope was a canvas called Silence, which seems to depict a group of mourners gathered around a coffin that was about to be lowered into the ground. However the mourners had about them a decidedly ghostly aspect, suggesting, perhaps, that the soul about to make the journey to "another dimension" was the one that was truly alive. 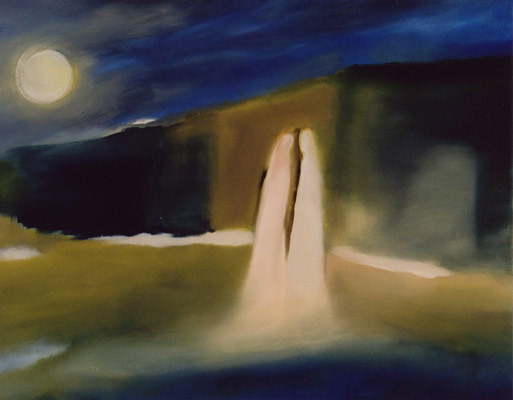 Similarly, in another painting entitled Encounter, two pale white beings convene under a full moon in a misty nocturnal landscape with a decidedly otherworldly atmosphere. De Echevarría's smooth paint application and luminous colors, akin in certain ways to those of Georgia O'Keeffe, another artist attracted to the arid landscape of New Mexico, contribute to the haunting beauty of Encounter. Even more than O'Keeffe, however, María de Echevarría appears to be a kindred spirit of Mark Rothko, another artist whose work can be called spiritual, albeit for slightly different reasons. This kinship seems especially clear in de Echevarría's extremely simplified landscape compositions in which the canvas is divided into horizontal bands of color. Unlike Rothko, however, whose compositions were invariably reductive and abstract, de Echevarría's paintings always evoke the sense of terrain. This is true even of her most ostensibly abstract compositions, such as the remarkably beautiful large canvas called Opening to Another World, where two numinous rectangular forms, one blue, the other a glowing white loom against an expanse of sky. 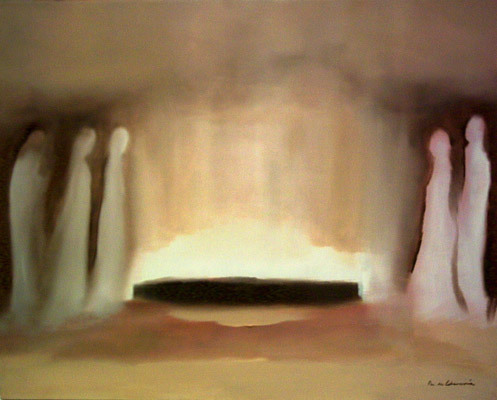 Here, as the title suggests, de Echevarría appears to depict the literal portal between the earth and some otherworldly realm. The earth, however, is in shadow, while the other world is entered through a gateway of light. In those and other paintings-many depicting strata of clouds and mountains enveloped in atmospheric mists and clouds illuminated by a rainbow range of auras-María de Echevarría paints with a conviction of someone in possession of special, intuitive knowledge. She evokes a rarified realm that most of us have only visited in our dreams and, by virtue of her impressive painterly gifts, imbues it with a startling verisimilitude.